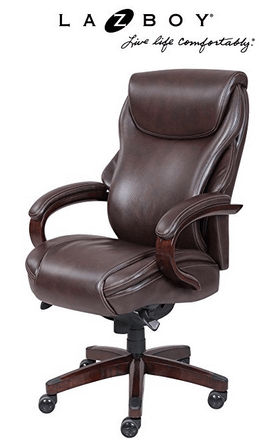 In purchasing an office chair, one must take note of the design, materials used and price. We believe that La Z Boy Hyland Executive Chair from Amazon.com as the Top Choice expensive chairs. With its ComfortCore Plus and advanced layering system provides exceptional comfort and support. ​Sleek & professional design. Also with elegant support for all-day comfort. ​Adjustable seat slide. 3D Armrest. ​One year limited warranty. Maximum capacity of 250 lbs. We have tested more than 12 expensive office chairs since the first week of 2018. 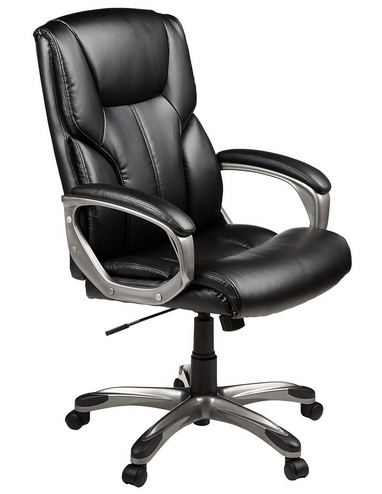 We are confident that the selected few expensive luxury office chairs on the list are the best! What makes expensive luxury chairs worth the money? Do you really need to buy expensive luxury chairs? There’s nothing better than the feeling of an expensive office chair. Aside from the classy connotations, there tends to be a raft of additional features and extras that come bundled along with the chair itself. All of those premium touches may be teeny compared to the bigger picture, but they add up to a superior experience. We’ve may be a little biased, but we love little details like find and intricate upholstery stitching. The best way to gauge the quality of any product is to take a look at just how much work was put into the details. Luxury isn’t tied to a price tag alone, but also to the way the product caters to you far better than any of the others do. The best luxury products offer premium prices, but also premium comfort and class. From added lumber and posture support to plush padding and extra comfort, there's always a reason to treat yourself to something a little nicer. Investing in a good chair is never quite as easy as you’d normally assume. They are many things to consider and – unless you’ve got plenty of cash to throw around – you’re going to want to find something that’s worth the initial investment that you put into it. 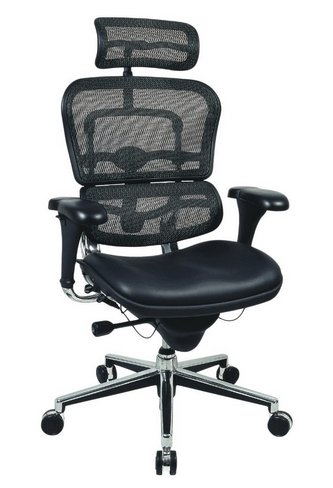 You must also keep in mind that many higher-end or luxury office chairs have very low trade-back values. This makes it quite a bit more important for you to choose something that you’d be happy and comfortable with over a long period of time. If you need a guide to some of the better expensive chairs on the market, we’ve listed five of the best expensive office chairs below. There’s also additional information about what to look for when perusing, so let's get started with the most important question. Is there really much difference in expensive chairs compared to cheaper models? It's a valid question, but the answer is simple. Expensive chairs generally tend to have a range of features, and they’re made of better materials. Compared to mass produced cheaper chairs, they dominate in every area, aside from pricing. They’ve always got materials that are far superior to all mid-range chairs. Luxury manufacturers also tend to place a lot more effort into researching the mechanics that they develop. This gives them a far better way to apply newer technology like smart support or comfort systems. The larger companies usually invest a lot more in research and development than the manufacturers of cheaper chairs do. This is usually where most of that large price-tag comes from. The manufacturers that don’t invest in research and development usually wait for the luxury manufacturers to produce their expensive office chairs and then try to imitate the finished product as best they can. The most expensive chairs sometimes rely on branding and reputation to achieve sales, but they’ve often built that reputation on a solid base of satisfied consumers and coveted products. So if you’re going to shell out, make sure to do so wisely, and do research beforehand. Because once you’ve tried out a quality seat, you’re never going to want to go back to the norm. You also wouldn't want to make an expensive mistake, and reselling luxury office chairs can be difficult. This is a particularly annoying problem with some of the more prestigious luxury manufactures. They tend to produce new lines at an almost annual pace, quickly making the last generation of their products redundant. The more generations behind that a line of expensive office chairs is, the more its price drops – at an exponential rate. What’s even more worrying is that if you change your mind and decide that you’d rather sell your new chair to trade up to another, then you’d have a hard time trying to find a buyer who’d pay near showroom prices for a used chair, when they could get a similar, year old used chair for a far lower price. We’re going to start the list with a cheaper chair, but that’s the point of no return. If you want the better things in life, just carry on scrolling down. This executive luxury office chairs is on the lower end of the pricing scale, but that doesn't mean it should be dismissed straight away. The bestselling Amazon offering might be a little basic, but it does the job at a fraction of the price of others on this list. If you’re only planning on using these luxury office chairs for decoration or on the odd occasion, it’s more than capable of fulfilling the remit. Before settling on a pricier chair, it’s worth asking, would this one be better for me? Though it is on the lower end of the expensive office chairs price wise, it still performs like one of those luxury office chairs. Bonded black leather is soft, supple and luxurious to the touch. The padding is soft enough to sink into but still offers enough backbone to give support. 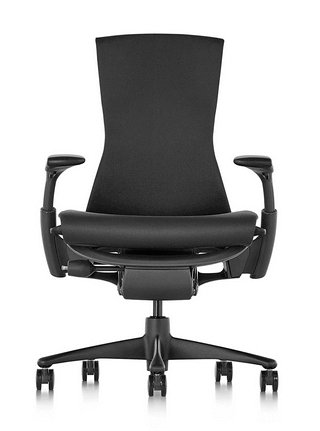 Ergonomic and high backed, the design will keep your back aligned and your circulation moving. Everybody's idea of comfort is different, so the adjustability and customizations you can get from these expensive chairs will make sure that everybody finds their sweet spot that will keep them comfortable all day. if you need to lean back to take a breather then you can unlock the tilt of the chair. Once you are in position, you can lock it again to stay that way as long as you like. Is this the best office chair on the market? Not by a long shot. Will you be getting your money's worth? Absolutely. ​Whilst it’s a decent chair, it looks and feels cheap. The additional posture support and build quality found in others on this list make it even worse, although it’s a good chair in its own right. It's probably too cheap for most of the people perusing this list. Even so, it's a decent chair if you’re not keen on going all out. It’s well reviewed, and it’s dependable. It’s a great option to go for if you’ve got a large space that needs a lot of premium chairs. It’s not as highly priced as the other expensive office chairs on this list and it’s comfortable and premium. Furnishing an office with this chair is a great way to keep a workforce comfortable and productive over those long office hours. ​This is more like it. The La-Z-Boy brand is synonymous with exaggerated comfort. Famed in popular culture because of shows like Friends, these expensive chairs are sleek and padded as you'd expect. ​It has a memory foam layering system for enhanced comfort, with ergonomic controls to provide maximum support. It'll also help with posture in the long term. The contours will keep you from slouching, which allows for better productivity and back support. Anybody who suffers from circulation problems will be happy to hear that the chair has a Waterfall seat edge. The coffee brown is a nice shade, made with bonded leather. The finish on the arms is a nice, polished wood, with mid-tier components completing the build. The layered body pillows feel like you are spoiling yourself with comfort, but they serve a more practical purpose than just to feel luxurious. The design is such that there are no pressure points anywhere on your body that would impact your circulation. Since your blood is able to flow freely, you get the oxygen you need and that prevents fatigue from sitting for too long. There are five layers of memory foam to give you support on your seat and won't compress over time. The top layer is a polyfiber fill for softness. Various payers of different density memory foam are layered below that to offer varying levels of support. The bottom layer gives the most of that support and keeps the shape of the rest of the foam layers. Assembly isn't particularly difficult if you have any experience, which is good for most of us with basic home improvement skills. Perhaps it's a little garish, and it won't suit every office setup. It's more of a luxury office chairs type, so it's worth thinking about how it will look in the surrounding environment. La-Z-Boy is a trusted brand, and the price point isn't bad considering the overall package. It'll definitely make your friends jealous, and it'll keep you snug and comfortable. The fine leather upholstery is treated and toughened to make it plush enough to be comfortable but not so much as to cause it to stick to surfaces, warp or degrade over time. You’ve still got to keep it away from moisture and liquids as they can force the leather to degrade faster and drastically lower its usage life. The fine details on this chair are especially luxurious. The paneling is done with exquisite wooden surfaces that are polished to a glossy finish. The stitching on the seamed parts of the chair is so finely uniform that they look good enough to be on an expensive bespoke suit. The Waterfall edge and the polished arms show the mix of comfort and quality, but there’s more to it than looking and feeling good. These expensive chairs will keep you properly supported during extended periods of use, and they'll make you feel like a king. As the name suggests, the Ergohuman executive expensive chairs are made with ergonomic considerations in mind. It has multiple layers of support, as well as a headrest for enhanced comfort. ​It has tilt tension control, tilt lock, seat & back height adjustment, seat depth adjustment, arm height adjustment, and the armrests also pivot. If you want a mid-range chair at a reasonably affordable price, it’s likely to save you repeated trips to the chiropractor in the future. ​The settings make for a highly adjustable chair, that has the capability to suit even the trickiest body type. It’s clearly intended for extended periods of use, and it’s one of the firmest on the market. If you want something a little softer, it might be better to take a second look at some of the other options on this list. If you tend to overheat while working in expensive office chairs then you will gladly give up the luxurious feel of leather for a more practical mesh backrest. You won't find your shirt getting damp while working which ends up being a big distraction and limits your productivity. The shape of the backrest is such that it keeps your back in alignment preventing any stress on your lower back. This also improves your circulation. Okay, so I’m just going to get this over and done with. It’s kind of ugly at first, and it looks a little like a dentist's chair. It may not look pretty enough to be called luxury office chairs, but it more than makes up for it in performance. That’s because of the emphasis on supporting your frame properly - and to be fair the base and arms do feel and look good. For a decent price, there’s all the ergonomic Chair support you’re likely to need. It’s nowhere near as classy as the two below, but it is slightly cheaper. Despite the lowered price point, it will keep you supported adequately, and it's not that bad to look at once you get used to it. As we start to get into the high end expensive chairs, every chair is pretty tempting. Let's see what's next up on our best expensive chairs list. As the second most expensive chairs on our list, it's worth pointing out that it originally retailed for $1500.00. That's a serious wad of cash, so if you're expecting big things, I don't blame you. 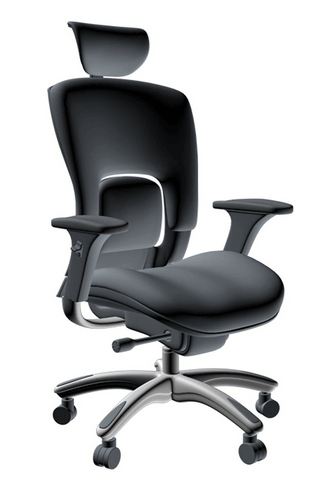 ​It's a fully ergonomic chair, with adjustable parts that allow for maximum comfort during extended use. That includes; the seat, the headrest, the 3D armrest, tilting, along with seat height and depth. So everything, basically. ​It's genuinely one of the most comfortable seats I've used, finished in real leather. The odd shape is designed to keep your posture, and it's advertised for all-day use. If you're planning on treating yourself, you could do much worse. The slope of the seat may feel odd at first, but it is for a very good reason. It is designed so that your legs are not pinched by the seat and your circulation is much better. Improved circulation will also improve your focus throughout the day and keep you feeling more awake and alert. The seat slide is adjustable, however, so if it is too uncomfortable for you, then you can always change the seat depth. No two bodies are the same, so this customization makes sure you are always in the most comfortable position possible. At this end of this scale, there isn't much to complain about these expensive chairs. Even so, it's a large amount of money to drop on a purchase that'll probably stay with you for a while. ​This is a brilliant chair, and well worth the sale price. The ergonomic features make it usable for extended periods of time, and it'll pay for itself in the long term if you improve your productivity. Before you decide, there's still one chair to go, and it's worth checking out. Designed for people who sit for longer than four hours a day, the Embody chair by Herman Miller is one of the best expensive office chairs you'll find online. The chair is responsive to your movement while seated, with all of the different types of support you'd expect from one of the best luxury office chairs brand in the industry. It's comfortable while keeping your back safe, and I'd highly recommend checking it out at the very least. 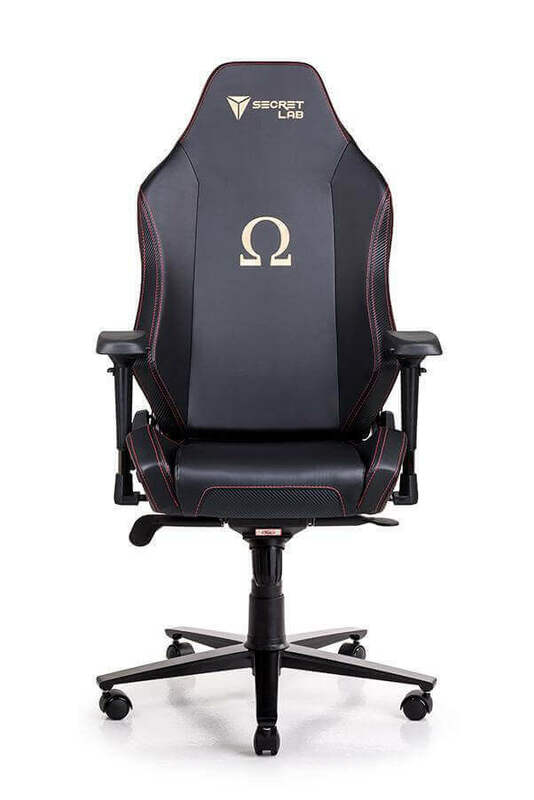 If you’re looking for one of the best expensive chairs that money can buy, this is one of them. Herman Miller offers a 12-year warranty on the chair, so it works out to be reasonably affordable if you keep it for the full duration. It also ships fully assembled, removing another expense. The ergonomics of these expensive chairs will keep you comfortable which in turn will increase your focus and productivity. it was designed with the help of 30 physicians to make sure it solves the health problems caused by sitting for too long. There are no pressure points anywhere in these expensive chairs so you'll always have the proper circulation to make sure your oxygen levels are high throughout the day. If you often feel fatigue when sitting for too long, it is usually because of the poor circulation caused by badly designed expensive office chairs. Besides the comfortable posture it affords, the material of these expensive chairs are made to wick heat away from your body and keep you cool. ​It is expensive in the short term, but it does make sense if you're planning to use it regularly. Herman Miller is synonymous with quality seating, and you’re sure to be happy with your purchase if you decide to go for it. If it's in your price range, these expensive chairs have to be considered. When I first began freelancing, I could only afford an entry level chair for my home office. After many nights spent burning the midnight oil, I started to develop mild back pain, as well as stiffness in my knees after a few hours or so. I upgraded my chair as soon as I possibly could, and started to feel the positive effects straight away. Of course, you probably don’t have to sit in a chair for as long as I do on a typical day, but higher priced or expensive chairs options are generally worth the outlay, especially in the long run. I upgraded my chair as soon as I possibly could, and started to feel the positive effects straight away. Of course, you probably don’t have to sit in a chair for as long as I do on a typical day, but higher priced options are generally worth the outlay, especially in the long run. My purchase was a long-term investment, but there are many different reasons to upgrade. If you've redone your home office, or you just want to assert your authority in the workplace, you can't do better than a magnificent chair. It may seem like a luxury to spend hundreds or more on expensive chairs. Believe me when I tell you that the money you spend is not to show off. You don't just get a load of bells and whistles to make you feel like you got your money's worth. You get a chair that will help you be more productive as it keeps you comfortable for much longer. You get a back that stays aligned and leads to better overall health. Finally, you get a piece of furniture that will last a long time and has you spend less in the long run since you bought quality, to begin with. ​Expensive is a relative term, but it's better to spend a little extra to save in the long run. Aside from the health benefits of better support, expensive chairs tend to be more reliable, and they last longer. You could end up saving money in the long run. Just like a good pair of shoes or a tailored suit, refitting an expensive seat is often worth it, and it’ll cost less than replacing a cheaper model each year when it gives up. There are always cheap office chairs left in the streets of London in the hope that someone wants to recycle and use it, but you never see a nice chair left outside in the rain. It’s always better to consider your options and make an informed purchase. Buying an expensive chair is hardly decadent, and your spine will forever be in your debt. Plus, it'll make people jealous.